In 2005, the EAC bought a 90-year-old house on Fern Lane in Halifax’s North End. It took ten months and hundreds of volunteer hours to make it a beautiful home and a public demonstration of a green office building. Our showcase building inspired hundreds of property owners and builders to make greener choices. Upgrades ranged from better insulation to the installation of solar panels. You can read more about the work and features of our first renovation HERE. Almost a decade later, we outgrew our home. The number of staff, volunteers and members at EAC more than doubled, and our need for more space became urgent! In 2013, we began carefully considering options for growth. We soon reaffirmed our commitment to Fern Lane and to continued investment in this neighbourhood, this building and this community. As a result, we decided to embark on a major renovation and expansion project. Our goals for our second renovation included creating a larger working space, making the building more accessible and welcoming, maximizing our energy efficiency, and creating a superb demonstration of a green building retrofit. Read on to hear stories from our 2015 renovation and learn about the decisions we made along the way. 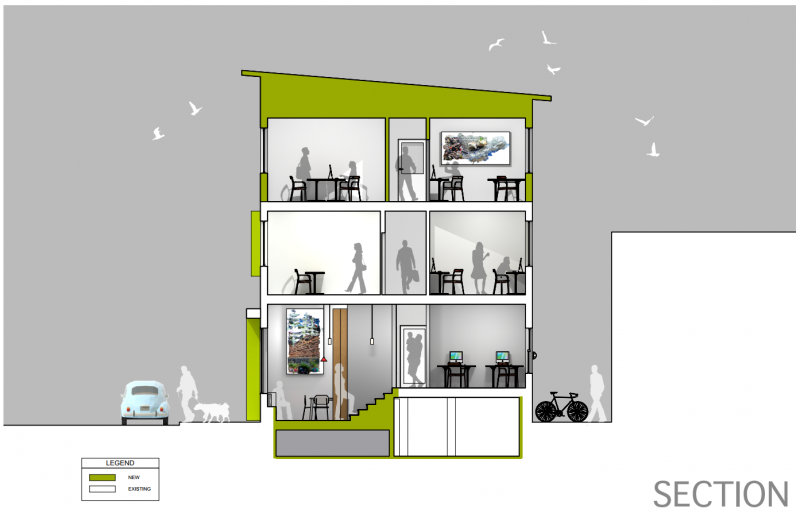 See all schematic designs from this project here. 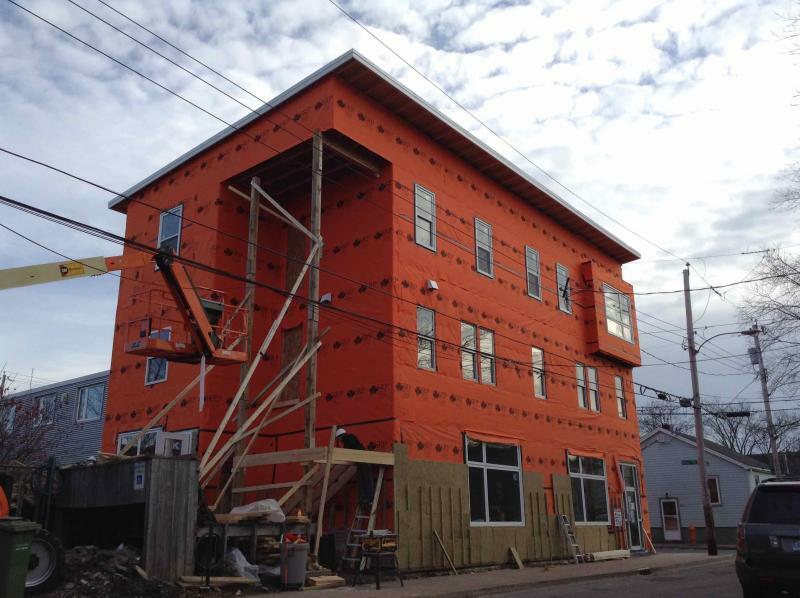 In September 2014, we began working with Solterre Design and Tekton Design + Build on designs for the renovation. The team was tasked with providing the EAC with a green building while comfortably housing its ever-expanding number of staff and volunteers. We considered a few schemes for the renovation.The options included clearing the site and building new, and various ways in which the existing building would be kept. The EAC’s Fern Lane home dates back to the late 1800s, when it was built for residential use. For all the charms Victorian-era buildings can provide, they can pose an equal (if not greater) number of problems for owners. But Solterre Design co-founder Jennifer Corson had a strong interest in salvage. And after extensive budget consideration for the varying options, it turned out that keeping the existing building gives the EAC more bang for its buck. An all-new construction was the most expensive option and also the option providing the least amount of office space. Accordingly, Corson explains, this combo made a new construction a non-starter for the EAC. After investigating multiple construction and design solutions, we decided to build a third storey (!) on our existing building, upgrade our foundation, change the layout of our main level to gain a more welcoming street level presence, and make improvements to the entire building's exterior shell to increase efficiency and comfort. But potentially the most important aspect of keeping the existing building is the project’s ability to serve as a teaching tool. Thanks to contributions from our members and the broader community, we were able to fundraise the money needed for our Next Level Renovation, more than $300,000. You can learn about each creature featured in Jeff’s mural HERE. We began construction in May 2015 on an extensive renovation that blended new construction. Here are a few of the features of that construction work. Volunteers played a critical role in the creation of our #EACNextLevel building. In 2015, we held a series of “Work Parties”. Over 1,800 hours of volunteer time was been donated to this project thanks to an extraordinary community of supporters passionate about the environment. Volunteers have helped with everything from demolition to painting and clay plasters. 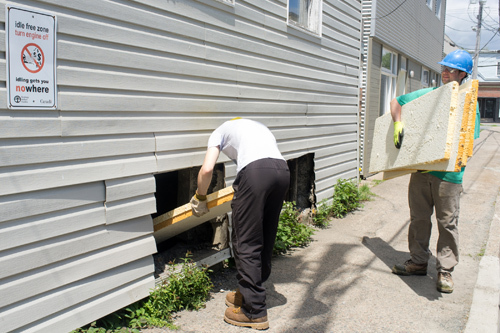 We also received help from the Parker Street Carpenter’s Assistant Skill Training Program. 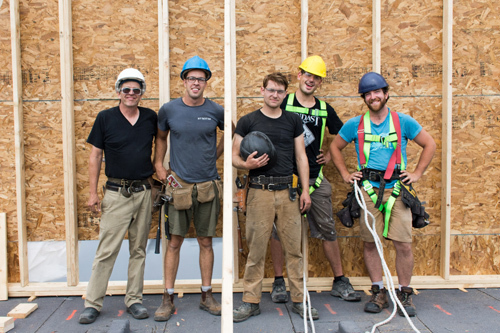 They lent their skills (and learned some new ones) in the renovation of the EAC’s Fern Lane building. 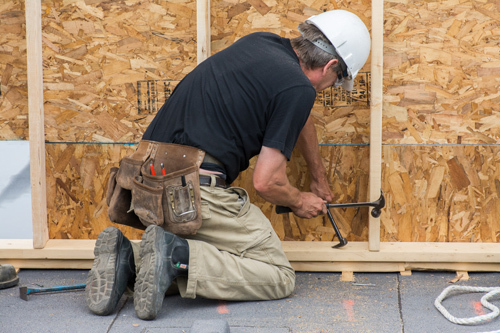 The non-profit program (which closed in 2015 due to funding cuts) worked with those who faced barriers to employment to provided training and certifications necessary to find and maintain entry level jobs in the construction sector. 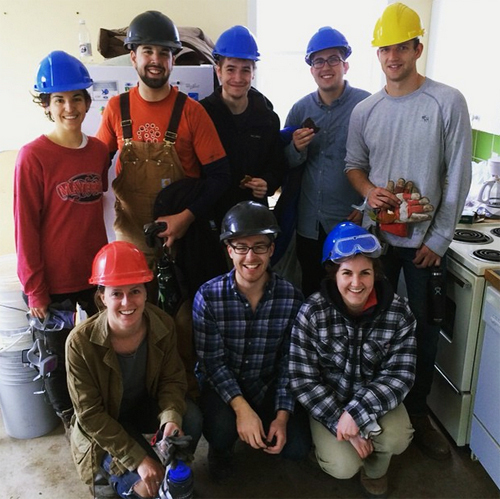 Participants helped us demolish several walls, as well as a ceiling and a chimney! We were very happy to get some extra skilled workers to contribute to our project, and to be part of such an important program. Photos by Katherine Nakaska, Emma Norton, and Maggy Burns. Local company, CarbonCure, helped us fill in old window openings in our foundation using 60 concrete blocks supplied by Shaw Brick. The blocks have a different chemical makeup from normal blocks thanks to the addition of 13 grams of carbon dioxide per block. Here’s the oversimplified version of the process: waste carbon dioxide is supplied by industrial gas suppliers. It’s added to the concrete mix as a gas, a chemical reaction occurs and the carbon dioxide solidifies and is evenly distributed throughout the block. The end product looks the same and weighs the same as regular masonry blocks. We salvaged an interesting array of materials including floorboards from the existing building which became a feature wall in the boardroom, beautiful old doors and light fixtures from former Dalhousie residential buildings that were being demolished, and 400 steel door cut outs for use as insulation. The steel door cutouts were installed under our foundation by the crew of Tekton Design + Build, EAC staff and volunteers. They were donated by Peter Kohler Windows and Entrance Systems. It was a win-win for both parties. Kohler was able to divert its excess material from landfill and the EAC obtains the perfect pieces for basement insulation (at the best possible price). The “cutout” is the piece of an insulated steel door which is cut out when a window is installed. They’re ideal for insulation under concrete because they’re essentially a sandwich of insulating foam between steel skins, tough enough to allow volunteers to walk on them during installation without getting warped. The cutouts are rated R14 in terms of insulation value. (The higher the R value, the greater the resistance the material poses to the movement of heat.) The recommended insulation value for basement foundations is R21. The EAC’s cutouts measure roughly 2.5’ by 5’ apiece. Based on that size, the 400 cutouts will provide a double layer of cutouts prior to pouring the concrete foundation. Energy Efficiency was a top priority for our green renovations. Energy consumption from buildings is a big contributor to global warming. While our renovation added 50% more space, it is projected to have a 22% reduction in energy use. 100% of the walls feature natural wall finishes that are made with local materials including clay, sand and straw. These finishes are beautiful, functional, and free of volatile organic compounds (VOCs). In August 2015, we started building the new third story of our Fern Lane home. We used an interesting and strategic process of building the whole third floor over the existing roof and making it weathertight before removing the old roof. 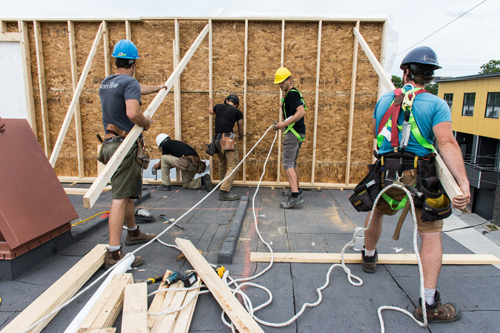 One of the big advantages of this method is that the building remains weathertight through the whole process, and the framing goes up really quickly. 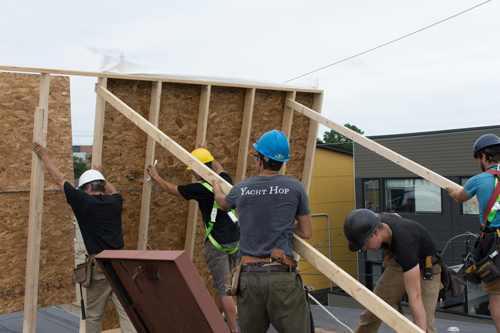 During this time we also completed the interior stairwell, started collecting great salvaged materials, framed the new boardroom, and added exterior insulation for the foundation. Photos by Katherine Nakaska, EAC volunteer project documentarian, and Patrick Jardine, of Tekton Design + Build. 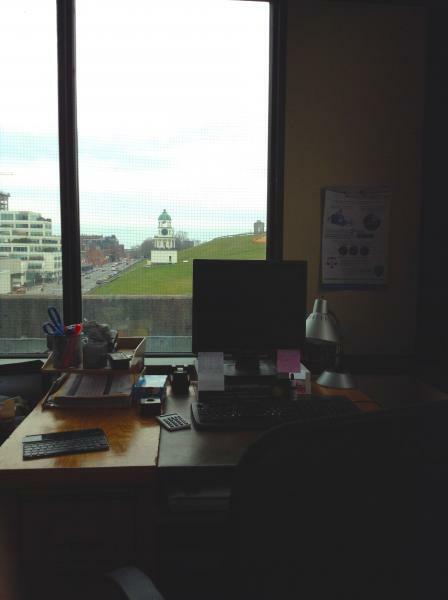 While our office was under renovation, we moved our daily operations up to the seventh floor of 1888 Brunswick Street. With the hard work of our staff, the passionate support of our volunteers, friends, and allies, and the warm welcome of our new neighbors, our time in Halifax’s downtown was as busy as ever! We hiked, biked, swam, and canoed across Halifax with our Hike the Greenbelt project. We held three Member Appreciation Events, our second annual Perfect World fundraiser, and a Living Shorelines planting day. We took action on climate change and energy efficiency, environmental racism, fisheries management, and offshore drilling. We took the Federal Government to court over genetically modified salmon. Our Energy Coordinator Catherine Abreu attended the United Nations Climate Summit in Paris. Long story short, it was an eventful seven months. We were thankful to Queen Square Development Ltd and Linda Harrie of Colliers International for helping us find our excellent temporary home and everyone else who helped make the transition possible. Choosing building materials for the EAC’s refurbished home lead to even more pointed questions. Our renovation was not simply a way to make Fern Lane bigger and better – It was about improving a great old building in accordance with EAC principles. the wood used should be harvested in a sustainable manner. In the end, the EAC chose to work with Jeff Amos, proprietor of Amos Wood. Amos supplied reverse board and batten siding composed of knotty spruce. The wood comes with a 25-year guarantee (once EAC volunteers apply stain). The choice couldn’t have been any more local. When visitors and passers-by admire the product, we can point them to Amos’s nearby storefront on Agricola Street. But Amos Wood is so much more than just a local option – it’s a small business using local lumber and sustainable harvest practices, headed by someone whose ideals go hand-in-hand with the EAC’s. As for Fern Lane’s existing wooden shingles, they were covered with an air & weather barrier, which will itself be covered with a vapour-permeable exterior insulation. This ensures the walls can “breathe”, allowing any moisture in the walls a path back outside. On moving day, FROGBOX Halifax loaned us seventy-five of their high-density polyethylene reusable boxes to transport our stuff. These boxes –which can be rented from the company– are reused hundreds of times and are easily recyclable at the end of their life cycle. Cardboard boxes aren’t often reused, and if they are it’s generally less than three times. Cardboard can of course be recycled, but on top of the energy required to turn it into new products, inevitably some of the cardboard will end up in landfills, requiring the harvesting of new materials. After four hundred uses, each FROGBOX produces roughly two hundred and eighty-two MTCE (metric tons of carbon equivalent) less than cardboard boxes reused three times. On January 25, 2016 we moved back to our beloved home on Fern Lane! We love taking individuals and groups on tours of our office. It is full of gorgeous clay walls and cool salvaged materials. It feels welcoming and has lots of space and light. And it’s a great example of energy efficiency – we have 50% more space but we’re projecting to use 9% less energy. We welcome visitors during our office hours, and can offer tours of the space to individuals or groups looking to learn more about green buildings. VIRTUAL TOUR – Check out some of the interesting features of our building on a digital walk-through. FERN LANE ENCYCLOPAEDIA – A more in-depth look at the green building materials and techniques we used during our renovation. STAGE ONE RENOVATION – Hear stories from our 2006 renovation and learn about the decisions we made along the way.